Move in ready condition! 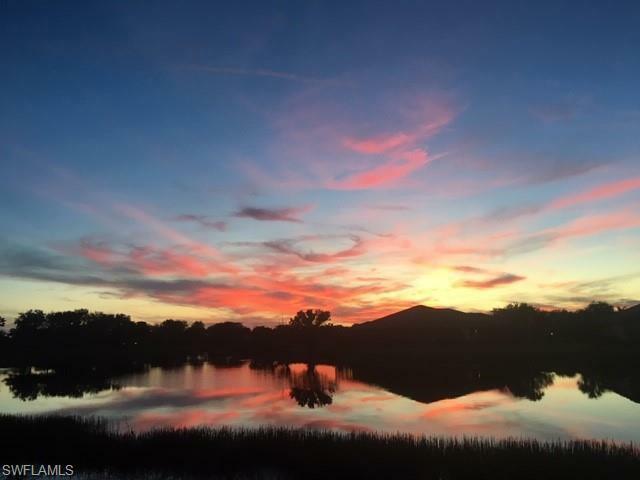 Popular Devonwood model on the water offering beautiful sunsets! Look out onto the LAKE from your first floor 2 bedroom, 2 bathroom condo! The Devonwood is the most spacious feeling, sunny and preferred layout. Elegant and bright kitchen has breakfast nook of large bay windows showcasing beautiful palm trees and lake view. This home features GRANITE counters, 16x16 inch over size tile, CROWN MOLDING, and screened lanai overlooking the lake. This home has been very well maintained, never rented, smoke and pet free! Covered parking with private storage, laundry room inside the home, hurricane impact windows, and landscaping included with the fees allows for an easy, maintenance free lifestyle. Easy walk to outstanding amenities! Bella Terra is a 1000 acre planned community with 100 acres of lakes and 400 acres of preserve. A massive 7000 sqft. Clubhouse offers a resort style pool & spa with waterfall, tennis, pickleball, bocce ball, fitness center and much more. Centrally located and only minutes to SW Florida International Airport, Gulf Coast Town Center, Hertz Arena, Miromar Outlet Mall, Coconut Point Mall and Florida Gulf Coast University.